Those who might think that this Document on Human Fraternity is simply another paper that no one will take any long-term notice of and that will soon disappear in the deepest recesses of some Vatican office, must understand that Francis and Al-Tayyib "announce and pledge" in the text that they will "convey this Document to authorities, influential leaders, persons of religion all over the world, appropriate regional and international organizations, organizations within civil society, religious institutions and leading thinkers" in order to "to make known the principles contained in this Declaration at all regional and international levels, while requesting that these principles be translated into policies, decisions, legislative texts, courses of study and materials to be circulated." In other words: This joint statement of principles is only the beginning of a wave of further texts and actions. You can expect it to be quoted from now on in Vatican documents and perhaps the next edition of the Catechism, which Francis has already "updated" with a new revelation from the god of surprises. Just before the signing of the joint declaration, Francis gave a lengthy speech in which he called all participants of the interreligious conference he was attending to “enter together as one family into an ark which can sail the stormy seas of the world: the ark of fraternity.” In a separate article, we dismantled Francis’ sophistry and demonstrated how his address contradicts the traditional and immemorial Catholic teachings left and right. “Pope” Francis is currently visiting the United Arab Emirates (UAE), a very brief trip that will conclude tomorrow, Feb. 5. 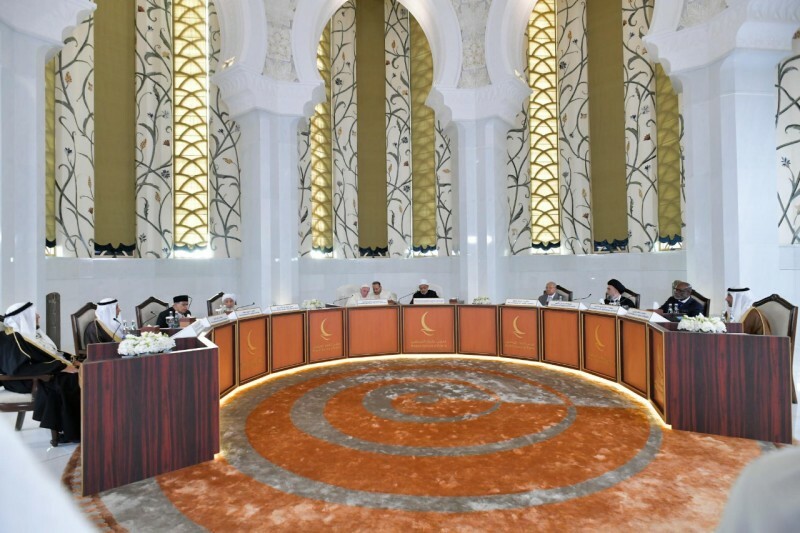 The main objective of the visit has been to attend an interreligious meeting on “human brotherhood” at The Founder’s Memorial in the capital of Abu Dhabi and sign a joint declaration with the Grand Imam there. This Francis did today. Before he took part in the interfaith conference, however, the Argentinian pseudo-pope paid a visit to the Crown Prince of Abu Dhabi and held a closed-door meeting with the members of the Muslim Council of Elders in the Grand Mosque of Sheik Zayed.